A green triangle pattern block weighs 1.5 grams. 1. What is the typical weight of a block in this group? Hm. What do we mean by typical? Discuss this with your classmates and develop an answer that you are prepared to defend before the class, using the pattern blocks as props if that helps. 1a. Is it the block that appears most often? That would be the blue block, because we have six of those. 1b. Perhaps we do not care about counting which block that appears the most, but when looking at the blocks do get a sense that a block type that only appears once or twice does not appear often enough to be considered representative of the group. We would still pick the blue block as typical, because there are not enough green or red blocks to qualify as possibly typical. 1c. Is it about the average weight of all the blocks? In other math classes you have probably learned than an average is when we first sum the values and then divide by how many values there were. The total weight is (1.5 × 2 greens) + (3 × 6 blues) + (4.5 × 1 red) = 25.5 total grams. Then we divide by how many blocks there are to find an average weight of 25.5 total grams ÷ 9 blocks ≈ 2.8 grams. The average weight of 2.8 grams is slightly less than a blue block. Should we say that the blue block is typical? Or is the blue block a bit more than typical? There is no right answer. The definition of the word typical is an English issue, not a math issue. However, notice how all three ideas in the answer above about the word typical—and any new ideas you or your classmates had—will all agree that if we have to pick one block as typical the best answer is the blue block. 2. Someone added two big blocks! Now what is the typical weight of a block in the group? 2a. Is it the block that appears most often? That would still be the blue block, because we have six of those. 2b. Perhaps we do not care about counting which block that appears the most, but when looking at the blocks do get a sense that a block type that only appears once or twice does not appear often enough to be considered representative of the group. 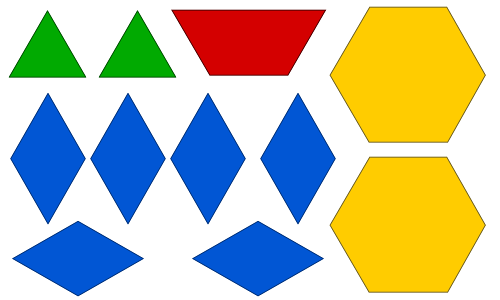 We would still pick the blue block as typical, because there are not enough green, red, or yellow blocks to qualify as possibly typical. 2c. Is it about the average weight of all the blocks? The total weight is (1.5 × 2 greens) + (3 × 6 blues) + (4.5 × 1 red) + (9 × 2 yellows) = 43.5 total grams. Then we divide by how many blocks there are to find an average weight of 43.5 total grams ÷ 11 blocks ≈ 4 grams. The average weight of 3.1 grams is slightly more than a blue block. Should we say that the blue block is typical? Or is the blue block a bit less than typical? Once again there is no right answer. We can disagree about definition of the word typical. It was perhaps Benjamin Disraeli who first said, "There are three kinds of lies: lies, damned lies, and statistics." Surely our uncertainly about how to use the word typical demonstrates that people can...exaggerate a bit...without really lying...when trying to be convincing. Let's see what mathematicians do to remove the uncertainly and ambiguity. We want some math terms to help us recognize when someone might be misleading us with statistics. Below is a chart that shows midterm scores for a Math 25 class back in Winter term 2016. This type of chart is called a histogram. Each bar shows a different category of things. (In this case, students with a certain test score.) The height of the bar counts how many things are in each category. 3. 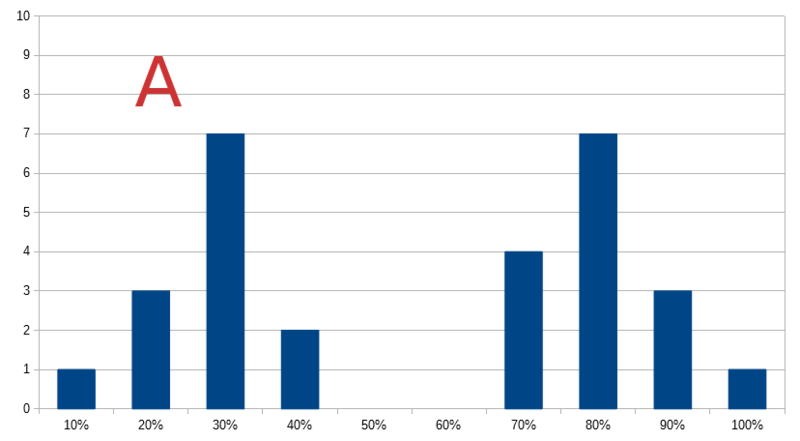 How many students scored between 80% and 90% (inclusive) on the histogram above? 3. The word "inclusive" tells us to include both the 80% bar and the 90% bar. So we are being asked to total the heights of all the yellow bars. 4. How many students took that midterm? 4. We are being asked to total the heights of all the bars. Let's group them by color just to help avoid making a careless mistake. Many histograms are like the one above and use categories with numeric values. The categories have a natural order because they are numbers for ages, weights, heights, test scores, etc. 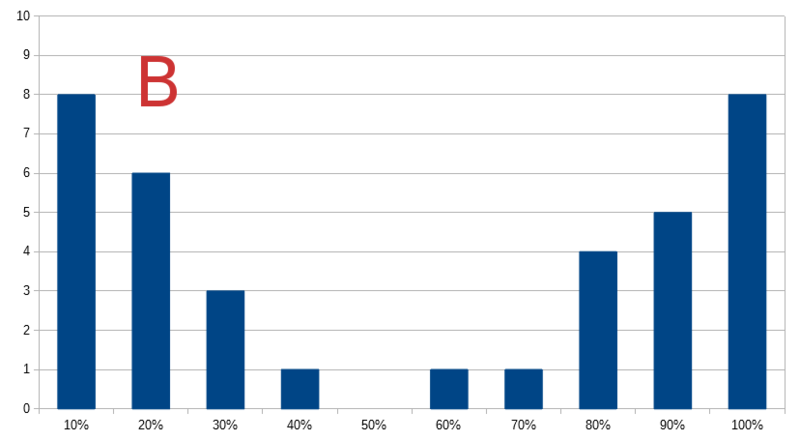 Not all histograms have numeric categories. Common examples include populations for different countries, costs of living in different cities, popularity of different foods, etc. The histogram above was also color-coded to group the categories into D, C, B, and A grades. But color-coding is not normally a part of histograms. Some histogams form one very symmetric clump. These are called bell curves because they are shaped like a bell. They are sometimes instead called normal curves. Bell curves can happen when an average result is the most common, being higher or lower than average is equally likely, and being way higher or lower could happen but is rare. 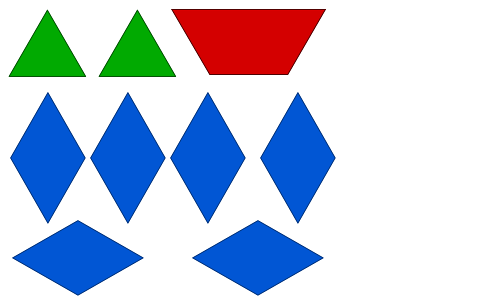 Random events such as the sum of two dice will create a bell curve. But to make a bell curve happen we need a histogram that counts a very large number of things. If we find the sum of two dice only a dozen times then wacky luck might produce some crazy histograms. But if we find the sum of two dice two hundred times we will always get a bell curve. Many physical characteristics of people such as heights and weights will form a bell curve if a large enough group of people are measured. 5. The randomness of rolling dice means that answers will vary slightly. A common answer is that you need to roll the dice between 100 and 1,000 times! Consider a pair of mostly similar bell curves. Let's say these bell curves are both histograms counting people. Because the two bell curves have the same area, they both count the same number of people. Because the two bell curves have the same middle value, the average is the same for both sets of people. The pink bell curve is taller. More of its people are average or nearly average, and fewer are notably higher or lower. Because of how bell curves work, this effect is exaggerated near the middle and extremes. The pink bell curve has a lot more average people, and a lot fewer extremely high or low people. The blue bell curve is shorter. More of its people are funky. Most are still average or nearly average. But comparatively more are notably higher or lower. Because of how bell curves work, this effect is exaggerated near the middle and extremes. 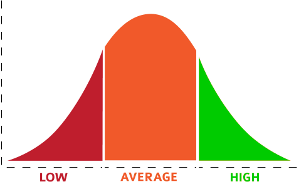 The blue bell curve has a lot fewer average people, and a lot more extremely high or low people. Both bell curves have mostly average people. Both bell curves have extremely high or low people. The "tails" of both bell curves do remain above zero: both curves even have extremely high or low people. Imagine these curves measured height. The pink bell curve is measuring a group of people that strongly tend to be about average height—not too many are much taller or shorter, and the group has very, very few giants and dwarves. The blue bell curve is measuring a group of people with less tendancy to be average height—many more are taller or shorter than average, and although the group still has very few giants and dwarves, if you happened to see a giant or dwarf it would probably be from the blue group. 6. Other than people's height and weight, what demographic characteristics form bell curves? 6. 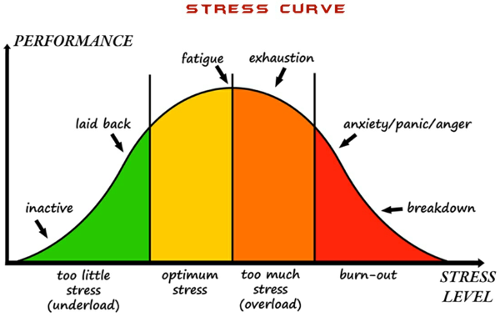 Natural characteristics that form bell curves can be difficult to brainstorm. Vision is one: most people have close to "normal" vision with near-sightedness and far-sightedness forming the sides of the curve. Strength of bicep and grip two others. Far more common is when people purposefully construct tests designed to sort people into a bell curve, such as IQ Tests or college entrance exams. Because these tests are designed to make the bell curve happen, they can do it very well. But that comes at the cost of sacrificing doing anything else well. IQ Tests are famous for measuring not intelligence but "whatever it is IQ Tests measure". College entrance exams do not reliably predict whether a student is actually ready for college and will successfully earn a college degree. Be especially wary if you read of socioeconomic characteristics that form a bell curve. Very, very few places have that shaped distribution of wealth, income, education, etc. But the field of sociology, especially in America, has an alarming track record of expecting these to form bell curves, and so researchers use increasingly sloppy methods of data collection until their expectations are finally met. Part of math jargon is giving certain words a very precisely defined definition. The words "average", "function", "parallel" have a meaning in math that resembles their standard use but is more specific. In other math classes you might learn about special math definitions for the words "commute", "set", "group", or "normal". Sometimes the opposite happens, and phrases that were originally a precise math definition shift to casual English usage and acquire a broader and fuzzier meaning. In math jargon, "grading on a curve" means something very specific. The test must be of a kind designed to have its scores produce a bell curve (such as the SAT or ACT college entrance exams). There must be enough scores to make sure that bell curve happens (the way it took many coin flips to make that situation have a bell curve). 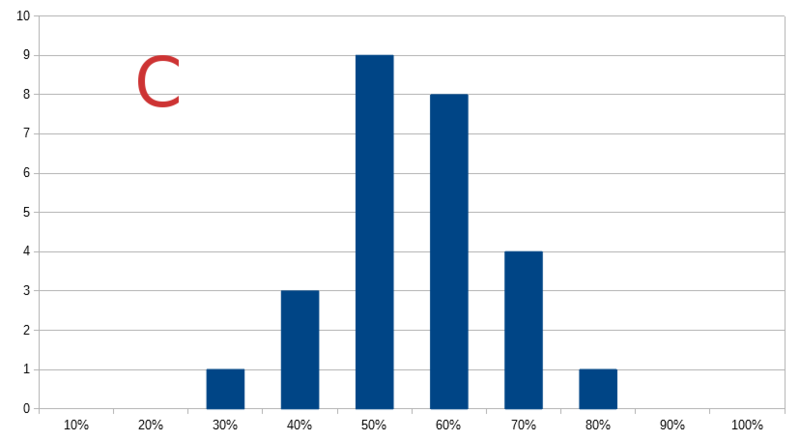 Then it would make sense to use the bell curve histogram to assign grades. Most scores are average and get a C. A smaller number of scores are slightly below or above average and get a D or B (and the number of D's and B's is nearly equal). A very few scores are exceptionally low or high and get a F or A. Moreover, tests like these, when they have hundreds if not thousands of scores in the histogram, are so predictable that grades can be assigned to scores before the test happens! 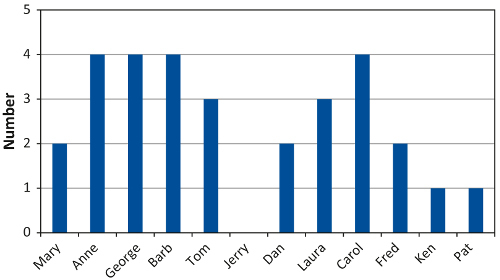 Last term's scores will have histograms almost identical to this term's. The test designers know where the distinction between each letter grade will happen even before the next test happens. All of this is what mathematicians mean by "grading on a curve". A very well-established history of histograms has proven that the test will have scores on a bell curve and everyone knows where the distinction between each letter grade will happen. In other words, if an instructor says he or she "grades on a curve" they are probably not using those words as a mathematician would. Ask those instructors what they do mean by that phrase. 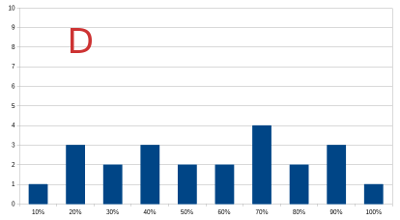 Usually they mean something vague related to the problem that very few histograms of overall class scores the histogram look like a bell cuve, and very few have nicely clumped scores like the first histogram above. (Designing a syllabus that makes either happen is extremely difficult!) If a score seems halfway between high C and low B, which letter grade does it get? Consider the first histogram with nicely clumped scores. What if an additional score was 78%, right between the C's and B's? There are only two options. Either the instructor would use the precise definition of "grades on a curve" in the wrong situation, with the wrong kind of assessment and way too few scores, and declare, "We all knew before the term began what the histogram should look like, and that an overall score of 78% would be in the C's." Or the instructor realizes that the precise definition of "grades on a curve" does not apply to that situation, and so must act subjectively by rationalizing some excuse for how to assign the grade. Such is the messy state of the English language. The second kind of instructor often says that he or she "grades on a curve" to specifically mean that he or she knows better than to actually grade on a curve! 7. If the first histogram above also had a score of 78%, would you assign that score a high C or low B? Why? 7. Heh. This discussion should be fun. The average you are most used to in other math classes is formally called the mean. To find the mean of a group of numbers, first add up all numbers and then divide by how many numbers are in the group. When people say "average" it should be safe to assume they are talking about the mean, unless they say otherwise. In most situations the mean is a very realistic average that provides useful information about the size of a typical value in that set of numbers. 8. In a certain preschool classroom, the students' weights are 34, 36, 36, 36, 37, 37, 38, 39, 39, 40, 40, and 41 pounds. What is the average weight of the twelve students in the room? 8. First we add up all the numbers. Then we divide that total by 12, because there are 12 students. This answer feels right. Some of the preschoolers weigh more than 38 pounds, and some weight less. The mean is also where a histogram balances. 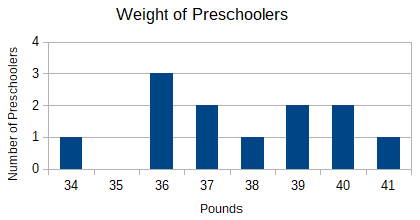 Notice that when you look at the histogram of preschoolers' weights it looks like the balance point is slightly below 38 pounds, matching our arithmetical answer. 9. 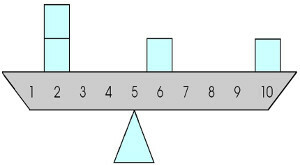 Double check that this picture of a balance scale is accurate, and the mean really is where the balance point is drawn at 5. 9. First we add up all the numbers. Then we divide that total by 4, because there are 4 blocks. The median is a different kind of average. It picks the middle number of a sorted list. To find the median of a group of numbers, first sort the list of numbers in order and then pick the middle number in that sorted list. If the list has an even number of values then there will be no middle value. Instead we find the mean of the two values most in the middle. 10. In a certain preschool classroom, the students' weights are 34, 36, 36, 36, 37, 37, 38, 39, 39, 40, 40, and 41 pounds. Three preschoolers insist their favorite stuffed animals, with weights 1, 1, and 2 pounds, also be included. Find the mean of all fifteen "friends" in the room. 10. First we add up all the numbers. Then we divide that total by 15, because there are 15 "friends". This answer feels wrong. All of the preschoolers weigh more than 30 pounds. The number 30 does not really represent anyone in the room. It feels wrong that the stuffed animals have such a big influence. 11. In a certain preschool classroom, the students' weights are 34, 36, 36, 36, 37, 37, 38, 39, 39, 40, 40, and 41 pounds. Three preschoolers insist their favorite stuffed animals, with weights 1, 1, and 2 pounds, also be included. Find the median of all fifteen "friends" in the room. This answer feels right. There are preschoolers who weigh around 36.5 pounds. It is less than the mean when we did not include any stuffed animals, but it feels okay that the stuffed animals have a measurable but not dramatic influence. The process of finding the median "throws out" any atypical smallest or largest values. You can think of the median as ignoring the most extreme values on a histogram and then finding where the rest of them balance. That is not quite how the median works, especially if the group of numbers is small. But in the real life situations where the median is used it will ideally behave that way. The median is appropriate and often used for company salaries, state incomes, house values, and other situations where the lowest and highest values are really should not be thought of as representative of the group. Just for the sake of completeness, know there is a third kind of average called the mode. The mode of a group of numbers is the number that appears most ofen. If there is a tie, all ties are modes. 12. In a certain preschool classroom, the students' weights are 34, 36, 36, 36, 37, 37, 38, 39, 39, 40, 40, and 41 pounds. Which weight is the mode? 12. The only number to appear three times is 36. So the mode is 36 pounds. The mode is so very rarely used in real life that it is only taught in math classes because of tradition. It will not appear in homework or a test. 13. The home values on a certain street, in thousands of dollars, are: 384, 364, 342, 346, 360, 356, 265, 417, and 530. What is the mean and median of these numbers? Which type of average best communicates the "typical" home on that street? The sum is $3,364,000. There are nine homes. Divide to find the mean. $3,364,000 ÷ 9 ≈ $374,000. The sorted list is 265, 342, 346, 356, 360, 364, 384, 417, and 530. So the median is the middle value of 360. The median home value is $360,000. In this situation the two kinds of average are close, but the median does a slightly better job communicating what is "typical" because more home prices are near $360,000 than $374,000. 14. A shipping company needs to transport seven freight containers. Their weights are 10, 16, 16, 18, 20, 60, and 77 tons. What is the mean and median of these numbers? Which type of average best communicates the "typical" weight of the containers? The sum is 217 tons. There are seven containers. Divide to find the mean. 217 ÷ 7 ≈ 31 tons. The list is already sorted. The median is the middle value of 18 tons. In this case the median is most "typical" for five of the seven shipping containers. 15. Two company clerks receive a report that only contains the mean and median weights, and number of containers, from the previous problem. The first clerk tries to find the total weight by multiplying the mean by the number of containers. The second clerk tries to find the total weight by multiplying the median by the number of containers. Which clerk is correct? Why? How much error does the other clerk have? 15. The first clerk gets 31 × 7 = 217 tons, which is correct. He "worked backwards" from the mean to the total. The second clerk gets 18 × 7 = 126 tons, which is too light by 217 − 126 = 91 tons. The median neglected the two much heavier containers which made his estimate is too small. Here are Math 20 review problems about switching between fractions, decimals, and percent formats. Each time you load the page these problems change! 20. Find the mean of these six numbers: 135, 95, 11, 5, 33, 15. 21. Continuing the previous probem, find the median of those six numbers. 22. The histogram below (original source) shows the number of books read by different children. What is the mean number of books read? 23. Continuing the previous problem, what is the median number of books read? 24. Some histograms resemble a bell curve but have a lot more values to one side of the top of the curve. How do these "skewed" curves change the relationship between mean and median? 25. The following image from a book about mental health attempts to show that a normal amount of stimulus is healthy even though excessive stimulus is too stressful. The author also explains that most people have near-average stimulus levels that are not always fun but are not classified as mental illness; very few people have such extremely low or high stimulus levels to be considered mentally ill—or more accurately almost all people are sometimes near the extremes, but only for small portions of their lives. The graph below is not a histogram, and thus not a bell curve! Ponder its bottom axis until you realize why not. Then invent a different label for the left axis that does make the graph a bell curve, and explain your change. 26. During the 2007 strike of the Writer's Guild of America, two different news reports painted very different pictures of these screen and television writers. Were Hollywood's writers very wealthy and going to strike even though they earned much more than most Americans? Or were they poor and going on strike to defend the few thousand dollars they could earn from their writing? The headlines leave out two important facts. A very few writers earn millions of dollars (what would that do to the mean?). Almost half of the guild's writers don't write anything in a given year (what would having half the list values zero do to the median?) Resolve the puzzle by writing a few sentences that explain how a better understanding of averages and a more careful use of averages can portray the issues more clearly.